The retail real estate industry has faced many challenges in the decade since the crash. Most fundamental among them was a textbook case of falling demand facing rising supply. Few events are as etched in our collective memories as September 11th or, if you’re old enough, the first moon landing or the assassination of JFK. The meltdown week in 2008 that started with Lehman’s bankruptcy is certainly one of them. In the months that followed, it seemed we were heading into the jaws of another great depression and that the world as we knew it would never be the same. One must remember that the real estate sector bore much of the blame for the calamity. Easy credit and loose regulation had combined to fuel a sustained boom that was ending in the mother of all busts. Banks all but froze lending, projects died, companies downsized or folded, and those still employed focused on survival. It’s through this lens that we reflect on the launch of ACROSS a decade ago. What sane person would have said to himself, “What a great time to launch a magazine about retail real estate!” Through the rearview mirror “betting the farm” – or in this case, the winery – on such a venture now looks more like bravery than insanity. This issue of ACROSS celebrates the 10-year anniversary of Reinhard Winiwarter’s bold decision in 2008, and congratulations are indeed in order. As no magazine covered the European shopping center industry, Reinhard spotted a gap in the market. He decided to initially focus on the then booming market in “New Europe” with a cover story on Romania, which was the highlight of the first issue. One article noted gathering economic clouds on the horizon, but, like most of us, failed to spot the approaching tornado. 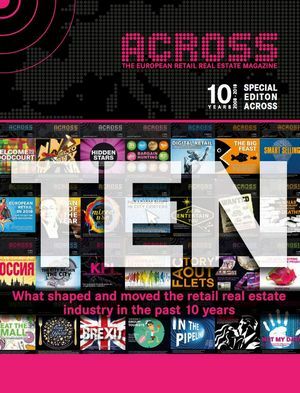 The anniversary of the ACROSS launch is an ideal milestone to reflect on retail real estate in the decade that followed the crash and to speculate on what the next 10 years might hold for our industry. What lessons have we learned, and how will they shape the future? Let’s start with 20/20 hindsight. The retail real estate industry has faced many challenges in the decade since the crash. Most fundamental among them was a textbook case of falling demand facing rising supply. Just as people fearing an uncertain future radically cut their spending, we delivered a record number of new places for them to spend. In 2008, we paid for the “irrational exuberance” of the prior 10 years. Viewed over the past 20 years, the graph highlights the alpine peak of new retail space delivered in 2008. 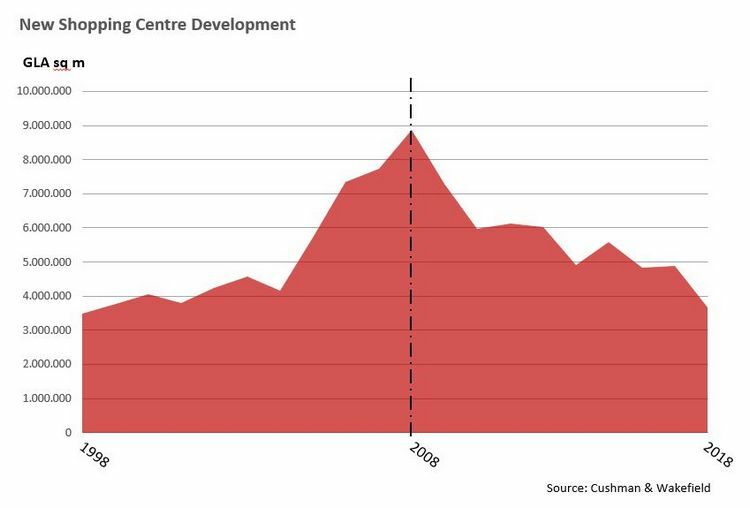 Shopping center development, while declining year on year in the decade since 2008, still grew by an impressive 50 million square meters, adding a remarkable 49% to the total. The post-crash descent would have been steeper had the pipeline not been filled by pre-crash euphoria. With the nearly miraculous recovery from the “great recession”, people have, thankfully, been spending again. The trouble, and our second great challenge, is that they are spending less in physical stores. Headlines would have you believe that we’re in the middle of a “retail Armageddon” fueled by the irresistible rise of e-commerce. It is true that brick-and-mortar sales in Europe fell from $3.52k in 2008 to $3.32k in 2017, or from 95% to 91% (Source: Euromonitor). While it presents a significant challenge for the industry, it is clearly premature to write the obituary for place-based retail. In fact, far from dead, a case can be made that our industry is at the dawn of a dramatic renaissance. Space in shopping centers dedicated to retail is forecast to decline from 77% to 62% over the next 10 years according to a recent ICSC survey. The most compelling destinations mix retail with leisure, dining, and services to create experiences that can compete with the convenience of online shopping. Food and beverage alone has grown from 5% a decade ago, to 10-15% now in Europe and is forecast to reach 20% of total space by 2028. New destination schemes typically have up to 25% allocated to food (Source: JLL). So, what does the next decade hold in store for the shopping center industry? The last decade was a lesson in the folly of trying to predict the future. That said, there are four trends that are fairly certain. Firstly, the realization that “shopping centers” will continue to evolve beyond retail is clear. They will increasingly be centers of commerce and community, offering a variety of dining, leisure, and services in addition to retail. Secondly, more and more cities will recognize that this vibrant mix of uses, activities, and experience is essential to their future. They will see that the expertise our industry offers to develop, curate, and manage great places is vital to their success. Thirdly, retail-anchored destinations will no longer be shunned by investors. They will once again appreciate the power of retail places to enhance the value of office, residential, and hospitality uses. And, fourthly, technology will continue to transform retail places, and the distinction between online and offline will increasingly blur. ACROSS and ICSC share a common mission: We both exist to communicate the trends that are reshaping our industry and to showcase examples of the people, companies, and projects at the forefront of change. Constant change and disruption make this job more challenging, but more vital as well. So, join me in congratulating Reinhard and ACROSS for their bravery and accomplishments over the past decade and wishing them continued success in the next.